BERSERK: RECUT (ベルセルク：再切断) is a fan project with the goal of editing the Kenpū Denki Berserk (剣風伝奇ベルセルク) anime to more faithfully represent the manga and Miura's vision. The result is hopefully a more faithful and streamlined anime adaptation of Berserk using the manga as script and storyboard. Feel free to compare it to the original anime as well as the manga. As a matter of fact, for the best experience it's recommended that you read the manga along with it. All feedback is welcome. I think it's pretty cool. I wouldn't mind pitching in to add bits from the manga if you don't think that would be too jarring. I really like the idea you have going with these. They seem to work really well keeping it very minimal almost giving it a flashback feel. I think example 1 just needs a little bit more sanding down, to help get things flowing better. Than again, I don't really have my copy of vol 1 on hand to reference too. I'll edit this in the morning when I've had more sleep, but yeah I really like this. I'm enjoying this! It's interesting to see exactly how much the creators of the anime altered the original work in their attempts to compress a much longer narrative. Like Bob said, it's got a nice flashbacky feel to it, so that even if we don't get to see the portions that were omitted, it's still fun to feel like you're "watching" parts of the manga. I think you've got an exciting project on your hands Griff, and I'd definitely like to see more! EDIT: I would say some of the later cuts need a little fine tuning, the edits with Guts and Griffith, to Guts and Gambino are a little abrupt. I would consider that a very difficult obstacle to overcome though considering how much material you have available to work with. Like I suggested to Griff last night, that particular transition could benefit from employing the dream sequence in episode 1, where we first see the God Hand. 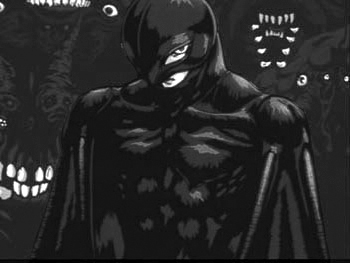 It could transition from Griffith's "ultimate principle" speech to Femto, and Guts saying "Griffith..." Similar to how Miura does it in volume 3. Buuuut the problem there is that that dream sequence isn't in the manga at all, so it's against the whole principle of the project. I can see how this thing would be headache-inducing... Still, it's a great concept and a valiant effort to correct the wrongs of the anime. Wow, thank you very much for the offer, Lith! I had considered it before (particularly a reaction shot of Puck), but wasn't confident in my abilities to create an image that would fit the style of the anime (it could be very jarring, as you pointed). I'm definitely interested to see what we can do. Thanks, and yeah, that video, even edited down as it is, still has some non-manga fat stuck in there. That's the maddening thing, I've come to better understand, and even admire some of their choices, the way they cut a lot of material, but used other parts to get the same point across concerning Guts' growth and his relationship with the audience. Unfortunately, that goes hand in hand with like 3-4 episodes worth of filler nonsense that's totally unforgivable considering that time and money could have gone towards depicting major sections that were omitted (Wyald comes to mind). It completely undermines their decent and even creative abridgment efforts. Thank you, and things smooth out a lot more once it gets stabilized with the Hawks and isn't jumping around so much. At that point, it almost plays out exactly like the manga in stretches. Episode 1 is a big hurdle though, I've spent more time editing it than any other, and I've gone through all 25 on multiple occasions. Thanks, part of the motivation for this is that there's still a lot of good material from the manga in the anime, and it's compelling, but it's just waiting to be cut out from the inappropriate fluff they added. I'm surprised how much better most scenes work when their cut to fit the manga more closely, considering the differences in the mediums, you would think most of the animators additions were really necessary. Nope. Exactly, there's even more to it than that, like before that dream sequence, in the woods, there's dialogue and scenes with the ghosts haunting Guts similar to parts of the second episode of volume 1, but it's so mangled, it's almost impossible to salvage a coherent scene out of it. There's several other instances like that later, and compromises do have to be made, such as the extent of Gambino's injuries, and Guts stabbing him in the chest rather than the neck (are those superficial differences enough to merit cutting those critical scenes altogether?). Anyway, I don't want to get too creative here, if that makes sense. I'm basically using the manga as the storyboard, so even though I could round things out a little more by using some creative editing of the material, it kind of goes against the point like you said. I look at it like, this isn't my edit, I don't have any right to authorship, it's an attempt at Miura's version, he's the director, I'm just the editor, and my job is to cut the "raw footage" together as true to his vision as possible with the material I have available. That's how I'm going at it. Thank you again for the kind words, it means a lot. This has actually been in the makings for years, and it's actually a lot of fun when you get down to it. It's also been a great way to study Berserk, both the manga and anime, on a level few probably have. Cool project! I like the idea of the re-edit that's true to the manga. I'd love to see Wyad's EPIC fight incorporated in the series. I watched the old aniime first before reading the manga, and was in such a good surprise when that fight popped up. 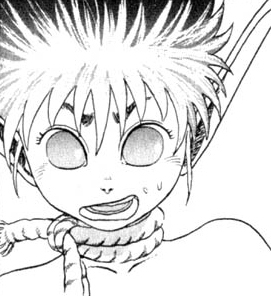 Speaking of which, I just watched Guts raising hell in the tavern in black and white and it looked pretty cool. That whole altered escape sequence in the anime is still a troublesome problem. It totally bastardizes the scene, but still contains an important moment, when Griffith's condition is revealed to the Hawks. Regardless, it's beyond saving and simply had to be cut altogether. I only wish I could animate Wyald into it, but even trying to smoothly insert a Puck reaction shot like the one below is already an iffy enough proposition. I think you should stay limited in what you do. Adding stuff is a little drastic, but editing existing material so it fits better with the manga's sequencing is a totally realizeable task. I dont think anyone really expects NEW animation in this. I don't think color grading Femto would be that hard. Time consuming, but not hard with a little after effects. Lots of rotoscoping. Yeah without even thinking about how to properly do it, I know it'd be possible to just batch process a color adjustment on the frames using Photoshop. Oh, don't worry, I'm not animating ANYTHING! Fortunately, my limited abilities keep me from really doing anything too radical anyway. Like I said, even trying to add a still Puck reaction shot is iffy. I definitely have all that in mind, and have edited accordingly; not only have I cut based on the visuals of the manga, but the dialogue as well. A quick explanation of the process, I'd have the raw episode in my editor, the media blaster DVD open separately with the subs on, and the corresponding Dark Horse manga volume in hand; that's how I went through every episode. If it wasn't in the manga, it's likely gone with a few exceptions, right down to a single word, phrase, or even laugh removed in some cases. An interesting example where those two disciplines cross paths and conflict in the anime is right before Guts is first promoted in the Hawks (when Rickert knocks him in the water). In the manga, before that happens, he has a lengthy inner monologue about the aim of his life since leaving Gambino, and Griffith's ambition. In the anime, the monologue isn't there, but portions of it appear in an expanded scene of Guts riding into battle, where we also see his flashbacks of Gambino. So, you can appreciate how it makes sense for the anime's purposes, but for mine it's a quandary: there's technically a scene where Guts rides into battle in the manga, before it flashes forward three years, and that dialogue is technically in the manga as well, just in a different part, so do I leave it in, just in a different spot, or not? It's not that much out of order, but you could argue it drastically changes the significance of both scenes, maybe worse than the anime originally did. It isn't just a superficial difference, or one where I can easily compromise (like two pieces of complimentary dialogue by a character being reversed, e.g. "Thanks, I'm good" versus "I'm good, thanks" which changes nothing. Anyway, my motto in difficult cases like this is, "when in doubt, cut it out." But, I DIGRESS, as for actually subbing it, I'd like to have that option, but it's not a priority until the edit is 100%. Colors were another thing I was going to just let go, but you guys are making a good push. I don't know, I'm only half kidding about the black and white thing. One of my original ideas was to try and get it down to about three hours, black & white, and have it be like an old Kurosawa movie. I don't know though, most probably couldn't stomach that? BTW, the current rough cut is about 6 1/2 hours. Making it into a feature film type of deal would be epic. I do admit liking of what I've seen so far. Keep up the good work. Thanks for the feedback. Everyone should feel free to suggest what they want, or don't. That's what I'm looking for with this thread. Don't be shy, folks, let me know where you come down on the different ideas being kicked around in here! I like the modest direction you've taken so far, with editing out the portions that don't line up with the manga. Moving forward, I think you should really think seriously about the scope of the project, if you haven't already. Will this thing have a complete runtime of 90 min, or 500? By cutting the fat, I think you could, on average, shorten each episode to around 15 minutes or so, making the entire 25 episode run about 375 minutes. Anything shorter than that might feel a little rushed, like, say if you tried to make it into a feature length film. Another thing, you should really consider smoothing transitions between scenes, particularly when it's a transition you fabricated for the purpose of the project. A suggestion to remedy these transitions is to take ambient audio samples from lulls in conversation to be used as background static. You can pair these SFX with static or looped visuals in order to lengthen a scene that feels like it ends too abruptly as a result of necessary trimming. This is a very promising project, you should keep it up! If it wasn't in the manga, it's likely gone with a few exceptions, right down to a single word, phrase, or even laugh removed in some cases. Aren't there any situations where editing stuff out (or changing the order of the scenes) makes the dialogue completely nonsensical? I'm talking specifically about the dialogue, not the significance of the scene or where it fits better in the context of the anime, like you already made clear to JezzaX. I think you'll be very lucky if you can simply "cut the fat" out of small scenes and get away with it making complete sense in Japanese. Maybe it makes sense when you see the subs, but only because they've adapted the dialogue, so you better have someone check it out before you completely trust the original subs. Also, if you plan on making new subtitles to bring it closer to the manga, you really gotta have someone that knows Japanese check this out, because simply subbing something different than what the character is saying would also be pretty bad, in my opinion. It'd be assuming everyone that'd watch it simply doesn't know Japanese and would accept adapted, or totally different subtitles. Obviously, I'm referring to bigger changes, not simple correction of names. I think the dialogue could be a pretty big problem later on if you don't be careful now. And I don't think inserting Puck in there would do it any good, to be honest. It'd stand out too much. Anyway, this is really great. I hope you realize you can't stop now. It's too late, we're all looking forward to it. I'm really enjoying this so far and can't wait to see how it turns out. This is more into the future but when you do start showing theses episodes, you should either host them on the site here or post them up on a torrent site. At first I thought you went off the deep end, Griff. Until I read into what you were dong I thought this was akin to a Star Wars nut trying to create a life-size replica of a star destroyer. lol well, maybe a little less preposterous. I think it's a very interesting and rather ambitious project you got going. Not to mention respectable. One of the killer problems with the anime has always been the shitcream filler. I wouldn't mind watching a 4-6 hour long version of the anime. No fillers, less extended still shots with nothing but sound and music, and recut to be in a more recognizable order. I would seed this. I actually just got around to watching it today, but I really like where you're going with it! It's an incredibly difficult undertaking, I can't imagine trying to piece together all the inaccuracies. This makes me even more hopeful for a new anime that sticks closer to it's source. Awesome title, by the way. So I hate to be a stick in the mud, but what's the legality of distributing something like this? I realize there's certain laws behind creative freedoms with licenses as long as you're not profiting etc., but torrenting out entire parts of the anime seems sort of questionable to me. You haven't heard of http://fanedit.org/?